Some examples of Steve the Juggler’s Performances. If you are thinking of hiring him for your event, then this is a good place to start! This page contains his official Performance Showreel, plus clips of Fire and Glow Juggling, followed by his 2 main appearances on UK Television (Question of Sport and Offside). Fire props, Glow props, Ball Juggling, Spinning Plates, SpeedCups, Diabolo, Devilstick, Club Juggling, Spinning Poi, Parasol and Ball, Rola-Bola, Knife juggling, lots of magic and much more! Exactly what it says on the tin! A demonstration of me using various fire props such as fire clubs, fire poi, fire staff etc. I am available to perform my fire juggling comedy magic show in the UK. A brief showcase of Steve the Juggler demonstrating his glow juggling skills. Featuring glow rings, glow balls, glow staff, glow poi etc. 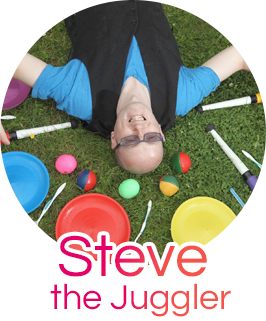 Steve is available to hire for Glow Juggling as well as all other juggling services. Steve the Juggler impersonates a well-known Sports Star in the Mystery Celebrity round of the Popular TV Show – Question of Sport. Will Matt Dawson and his team guess the celebrity who appears to be Glow Juggling? Steve the Juggler’s TV appearance on BBC Scotland’s Offside (Scottish Football) Programme in November 2003. Show is presented by Tam Cowan. Juggling Clubs as part of a Talent Show slot.